AP DEECET 2019 Apply Online Application Form: Andhra Pradesh Department of School Education released the Diploma in Elementary Education Common Entrance Test (DEECET) information bulletin 2019. Candidates waiting for AP DEECET Notification 2019 can check the details from the official portal, apdeecet.apcfss.in. The DEECET application process is started on 3rd April and the last date to apply is 21st April. This year the AP DEECET examination is going to be conducted on 15th May and 16th May respectively. And the AP DEECET result will be announced on 18th May. By visiting the AP DEECET official portal, applicants can find the online application form and by tapping on it, filling the details, attach the required documents, aspirants can apply AP DEECET 2019. Before applying for the AP DEECET 2019 aspirants can check all the details from the information bulletin. 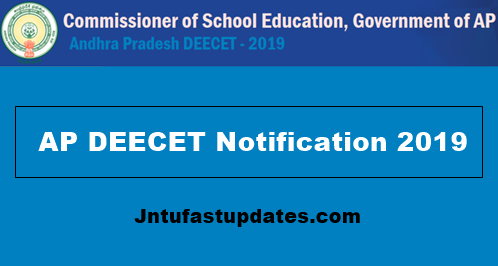 Here we have updated all the relevant information about AP DEECET 2019 Application form, exam dates, and syllabus, and other important details in this article. The government of School Education Department Andhra Pradesh annually conducts the Diploma in Elementary Education Common Entrance Test (DEECET) entrance test for admission into 2-year Diploma in Elementary Education course. AP DEECET / DIETCET / D.Ed / TTC (Diploma in Elementary Education Common Entrance Test) will be conducted in 13 districts of Andhra Pradesh and the applicants will have the choice to select the preferred examination center. The test will be conducted in online mode. Applicants must have the required educational qualification of 10+2 /Intermediate with 50% or above aggregate from any recognized board to apply for AP DEECET. Candidates clearing the DEECET with good merit will get admission in 2 years Diploma in Education (D.Ed) course in government District Institution of Educational Training (DIET’s) and Private Elementary Teacher Training Institutions in AP for the academic year 2019-2021. Aspirants who are keen to check more details about AP DEECET schedule, application process, and other details can navigate through the following details. Intermediate or equivalent educational qualification as decided by the AP DEECET committee. The candidate must have qualified in the corresponding qualification by the time of admission. Applicants must have passed the relevant qualifying examination with 50% or above marks to apply for DEECET 2019. While SC/ST/PH Candidates require 45% to apply for the DEECET. Note: students with 10+2/intermediate vocational courses are not eligible to apply for DEECET. Candidates should have completed 17 years of age as on 1st September of the year of admission. There is no recommended upper age limit to get admission in D.El.Ed/D.P.S.E courses. Applicants must have to pay an application fee of Rs 500/- through online using any debit/credit cards. Candidates applying for AP DEECET 2019 must aware of the syllabus and examination pattern to give a clear attempt and to get the good merit in the examination. Check AP DEECET syllabus and exam pattern details from the following. Physical Science: Physics and Chemistry as their Intermediate Subjects. Biological Science: Botany, Zoology as their Intermediate Subjects. Social Studies: Five Subjects viz., Economics, Civics, History, Geography, Commerce. Initially, applicants need to visit the DEECET Official portal, apdeecet.apcfss.in. Go through the AP DEECET 2019 information bulletin 2019 clearly. Register with the site using the email id and other required details and generate the unique enrolment number. Sign in with the generated enrolment number and log id. Fill up DEECET Application form with required information. Pay the requisite application fee through the provided payment gateway. Finally, click on the apply button. And take a printout of the application acknowledgment for further reference.